The guys of Westlife has made a successful career here in the UK covering derivative pop songs and stylings from other artists. This good-looking boyband from Ireland has a few decent songs of their own, but they choose to steal from across the Top 40 spectrum to capitalize on what’s hot today. 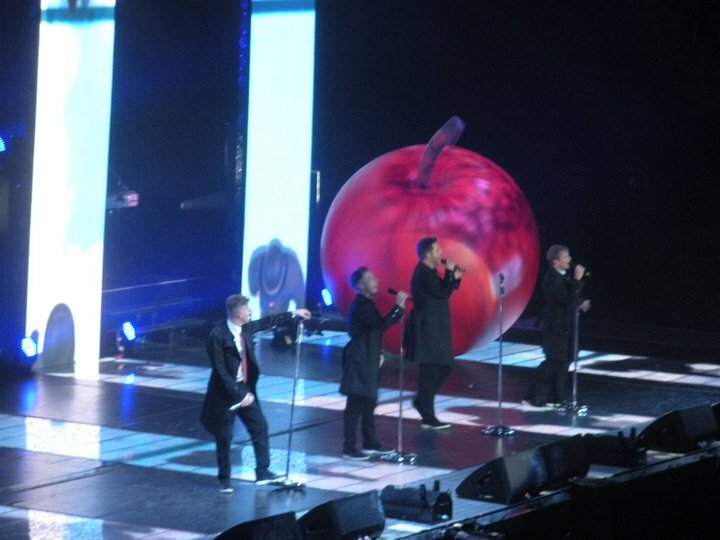 On the first gig of their two-night London stand at the futuristic-looking O2 Arena, Westlife gave the generally mixed audience what they wanted, and they truly ate it up. Sounding like a mix between the Backstreet Boys and American Idol (Pop Idol in the UK), they seem to be the most immensely unoriginal group out there. Still they looked great and their polished vocalizing were professional and ear-pleasing, but musically, Westlife really lacks musical substance. After emerging from one of several costume changes, an odd segment inserted into the concert turned out to be an extended cover medley. Copping tunes by Coldplay (“Viva La Vida”), Lady Gaga (“Bad Romance”), Rihanna (“Only Girl in the World”), Black Eyed Peas (“Dirty Bit–Time of My Life”) and other songs by Michael Buble, Kaiser Chiefs, Josh Groban and Daughtry, it suddenly transformed into a jukebox revue by way of Las Vegas. “Beautiful Tonight” is one of their few uptempo original songs they performed that was catchy and endearing. They would have enlightened more if these types of songs were pulled out from their catalog. But as is, they have to rely on other hits to fill out the time. Thanks to Josh Groban, the group’s emotive cover of “You Raise Me Up” is their biggest hit to date in Westlife’s 12-year career. However the boys’ first hit that introduced them was “Flying Without Wings”. It was performed as a generic snoozer of a ballad.